Evidence-based practice is “the conscientious, explicit, and judicious use of current best evidence in making decisions about the care of individual patients” (Sackett 1996). Under normal circumstances, evidence-based practice can be easily utilized. However, difficulties arise when seeking best practice for a rare disease, a disease that affects less than 200,000 Americans. It is often complicated to perform controlled clinical trials with such a small population and in some instances a rare disease’s best practice may lie in sporadic case reports. An individual rare disease may have little impact, but collectively there are nearly 7,000 identified rare diseases that affect 25-30 million Americans and even more worldwide. This poster will briefly explore the complicated relationship between rare diseases and evidence-based practice and will provide search strategies and resources for medical librarians seeking information on rare diseases. 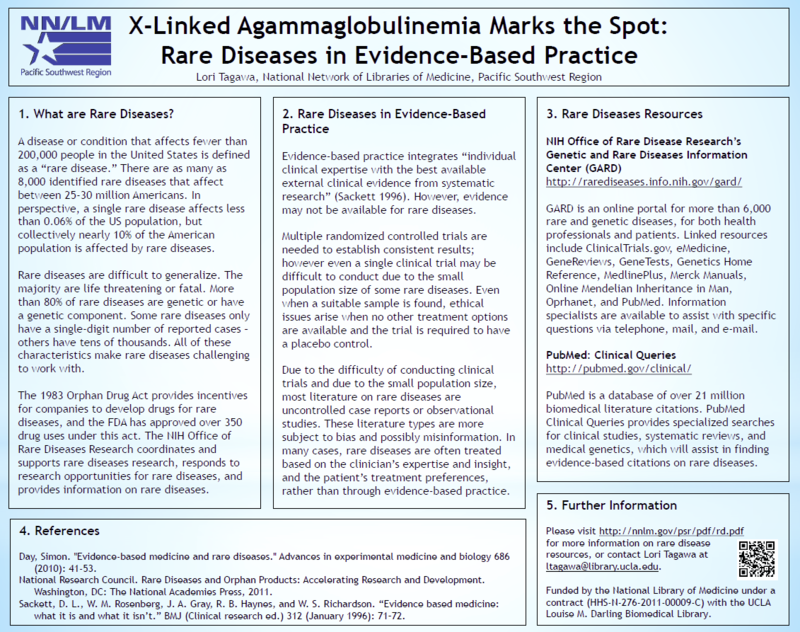 Download the full-size PDF of Lori Tagawa’s poster, X-Linked Agammaglobulinemia Marks the Spot: Rare Diseases in Evidence-Based Practice. Thanks for sharing this poster, Lori. It’s very helpful for rare disease info! I am wondering, since I work with pharmacy, if there is any overlap between information resources for these rare diseases and the orphan drugs category for FDA. Do you have any insight to share on this?